There's a lot packed into this four-page book, expecially when you consider one page is onr of Blackmon's glorious full-colour is a bit cartoon-y illustrations of a ship out in the black. Next comes a word list. Roll 1d100 and pick a first name, then roll another on a second column to get the rest of the name. (Rummages for dice)... OK, we shall take to the skies in the Capella Rocket. Then the fun starts. Why was it called that? Maybe it was the previous owners, and we all know it's bad luck to change a ship's name, right? But there's more! Another table (roll 3d6 twice) to find out what the type and colour of that strange-looking weapon you just found. Anyone want a weapon that emits line of discs that are gold in colour? No, I don't know what it does either. Heck, it may not even be street-legal here. Tiny but really useful resource, especially if your mind goes black when the party ask what the third ship over at the space dock is called! 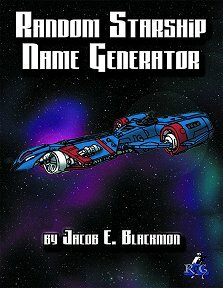 Return to Random Starship Name Generator page.